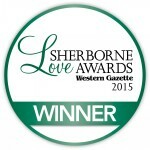 THE winners of the inaugural Love Sherborne Awards have been announced and Sherborne Abbey Festival picked up a trophy for BEST COMMUNITY EVENT. Short-listed individuals, community groups and individuals attended the awards ceremony in Sherborne Abbey on 15th October. Editor of the Western Gazette Emma Slee welcomed the nominees and their guests. She said: “These awards were born out of our desire to celebrate what’s special about Sherborne – the people, the places, the businesses and the community groups. “It became quite evident, quite quickly, that the public agreed with us that these things should be recognised, based on the response from the community and the nominations received. “A panel of six judges had the difficult task of deciding the winners out of the very worthy finalists in each category. Each judge submitted their scores individually, which were then calculated to produce the final results. I would like to thank each one for their efforts – the judging pack was substantial and each judge spent a lot of time poring over the submissions. Before announcing the winners she thanked Canon Eric Woods, for the use the beautiful venue, Steve Lee, the manager of Waitrose, for sponsoring the drinks reception and Mike Burks from the Gardens Group for providing the wonderful horticultural displays. The first two awards presented were Favourite Retailer of the Year and Most Welcoming Food and Drink Establishment. These awards were not assessed by the judging panel but the venue with the most public nominations was declared the winner. All of the other awards were decided by the judging panel. Short-listed entries: Kafe Fontana, Oliver’s Coffee House and The Pear Tree Deli and Cafe. Short-listed entries: John Baker, Andrew Maddock and Bill Heath. Short-listed entries: Sherborne Rendezvous, Friends of the Learning Disabled (FOLD) and Sherborne Volunteer Ambulance. Short-listed entries: Sherborne Abbey Festival, Sherborne Arts Link’s Positive Street Art Project Sherborne Mural, Sherborne Area Partnership’s Sherborne Health and Wellbeing fair and The Zest Cafe (Four Leaf Clover Club). Short-listed entries: Abbey Décor, Margaret Balfour Beauty Centre and The Eastbury Hotel.